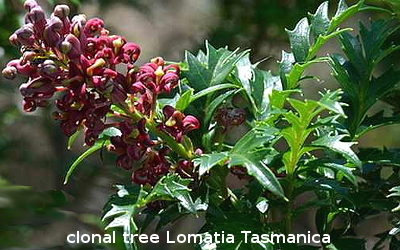 Plantation e.nitens and e.globulus (bluegum) trees grown in Tasmania are highly developed 'synthetic' trees. They are manufactured using 'one stop mass pollination' or 'mass controlled pollination' as the first stage of a clonal tree assembly line. If a nitens clonal plantation was left for a period of time, would individual tree roots and their symbiotic mycorrhizal colonies merge to become the single genet that biologically they already are? Do plant pheromones also achieve this outcome? What is the relationship between 2 different clonal plantations? What is the relationship between clonal colony (CC) plantations and native forest? Can CC plantations induce toxicity or even sterility in other organisms? Can koala bears become addicted to CC eucalyptus leaves? It's well known plants perceive light. Plants know if it's light or dark, in fact plants and humans share identical genes to detect light. In humans these genes control the timing of cell division, the axonal growth of neurons, and the proper functioning of the immune system. That's an important piece of DNA we inherited from plants. Plants don't have a sense of smell like us but they are masters of producing and detecting chemical signals. When fruit begins to ripen, it releases the hormone ethylene which is sensed by neighbouring fruit causing the other fruit to also ripen. The picture above shows roots of Zea mays bending towards a continuous sound source coming from the left. Plants may not 'hear' but they do recognise sound waves. Many scientists assume they have a right to genetically alter plants. Those scientists are in effect, claiming evolution failed to perfect plants and all other organisms. Haven't those scientists forgotten that evolution also created them? Therefore, their evolution must also be faulty. Why are the rest of us allowing 'faulty' science to alter our biosphere? In their profound ignorance, some scientists assume human economics is the only thing evolution did perfect. It's a pity observation fails to support that ridiculous idea.